Of the teams I saw at D-III Champies last season, we played the best defense. If we want to compete with elite D-I teams, improving individual defensive play is our top priority. The following video shows three plays. Watch each play and think about what the defense does right and wrong. This should involve watching each play multiple times, looking at what each player does. After you've done that, take a look at what PGL and I have to say below. 2012-09-19 Defense.mov from Adam Lerman on Vimeo. Game situation: Fourth game of the day. We are up 13-6, game to 14. Kenyon is receiving the pull going into a ~15mph wind. We are running flat marks, with poaches in the lane for the first few passes. The cutter PGL (#14) is marking goes deep. There's never a lane for a huck, and the offense is going into the wind. PGL correctly stays under his man. 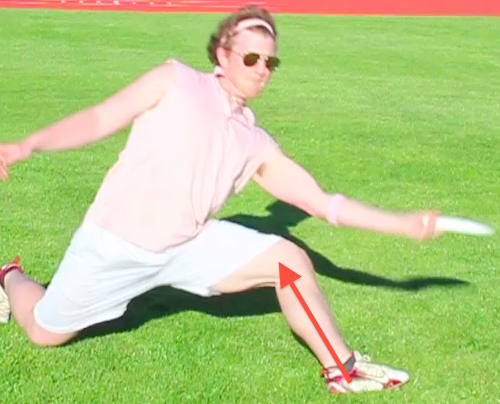 Also note that he checks where the disc is over his right shoulder at 0:34. 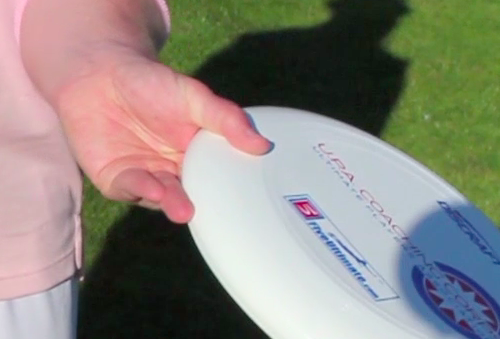 The disc swings to the handler on the left side of the field. Luke (#20) correctly stops the around continuation and forces the disc back to the right. It's Spencer's (#31) responsibility to be in the lane stopping the upfield pass. He probably should have shuffled over faster, but this isn't really a throw he should have been expecting. The Kenyon player puts up one of the best hucks I've ever seen. Again, there's no lane to huck into, so he bends an IO forehand that keeps its edge and is going to hit the perfectly in stride. We get a loud "UP!" call. Because PGL looked back a couple seconds earlier, he knows where the huck came from. 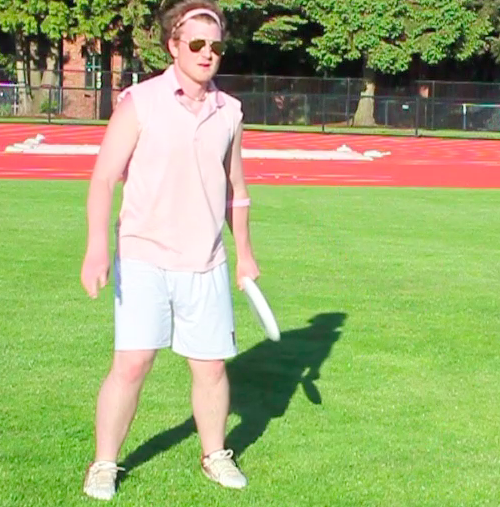 He knows to look over his left shoulder, and is able to get a read on the disc. PGL can probably tell that he has almost no chance of getting the D. In this situation, you sometimes see the defender give up on the play. PGL accelerates hard to the disc. The receiver is trying to milk the disc into the endzone, so PGL gets really close to the D. He also makes the receiver go up early. If PGL doesn't bid, the receiver catches the disc two steps later in the endzone. PGL's man dumps the disc to the open side. 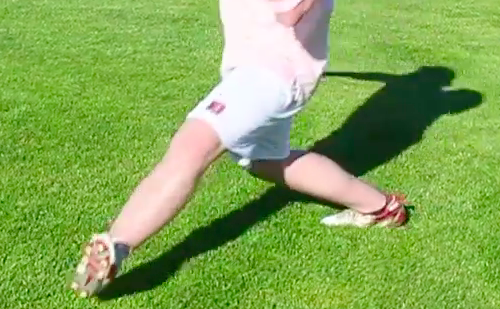 This is a give-and-go situation where the thrower can cut upline. As soon as the dump is thrown, PGL gets on the open side and takes away the upline cut with his body. We switch a lot here. Elliott (#7) is slow running downfield, so Spencer picks up his man (#11), who catches the dump. Luke runs to Spencer's cutter (#25), then tells Elliott to pick him up. Luke finds his cutter (#22), who is out of the play on the far side of the field. Eric (#23) is poaching on the open side the entire time. His cutter is way off on the left (off the screen). He's watching the disc, and takes a step towards the play when PGL's man goes upline. At that point, Eric should turn back to look at the stack, but instead he keeps watching the disc. 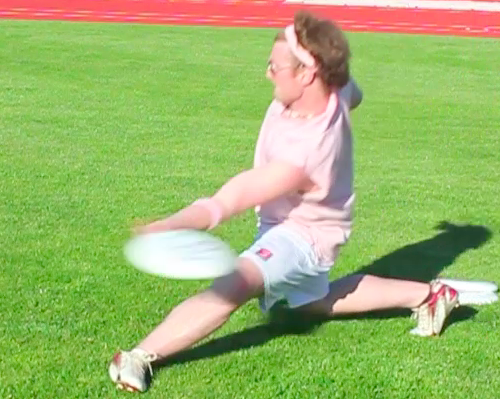 Jonas (#1) is bodying up in the stack 25 yards away from the disc. He'd probably be better off taking a couple steps off to the open side. His cutter gets by him, but he should have help from Eric in the lane. Because Eric is facing the wrong way, the cutter can run right by him. 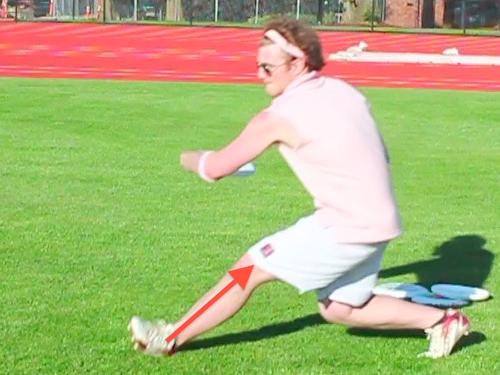 PGL maintains his position with his body between his man and the disc on the open side. As his cutter turns his back to the disc to clear out, PGL turns to see the open cutter. He makes a good bid, but he's half a second late and Kenyon gets the goal. Summary: I chose this play because what PGL does is the best example of great individual defense I saw in our film. What I did wrong: I made a late bid at a disc I didn't have a chance at, which could have hurt Eric (on the goal line). My mark looks ridiculous and I think it's one of the weakest parts of my overall game. I could have made a stronger play at that floaty disc. I was quite a few steps off my man when the disc when up and if I had been tight, I would have had a better chance at the D.
What I did right: It was an IO flick huck to the open side, so I was in correct positioning (my man was a wing cutter, or at least seemed like it and I was between him and the disc) aside from being too far off. 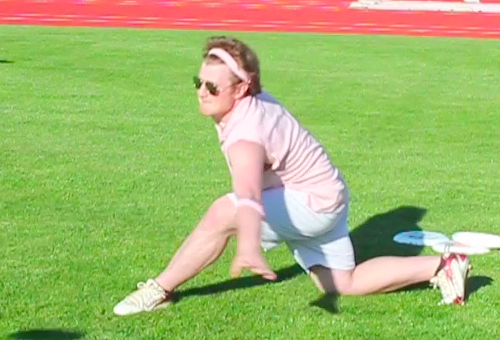 I set the mark as soon as my man caught the disc. 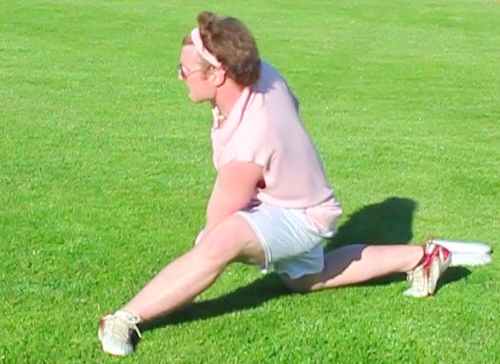 I shut him down for the one cut he made (even though the thrower wasn't going to throw it anyway). What everyone else did wrong: They got two free swings to center the disc (we need to run down on the pull harder), Sparrow did not keep up with his man going down field allowing for an easy reset, 20 got beat to the open side even though he saw the cutter coming and could have easily gotten his body in the way. Maybe the worst thing: No one was hustling while the disk was in the air, allowing Kenyon to have a solid step or two ahead of every defender. What everyone else did right: 20 was ready to pick up people cutting to the open side (this is good because our match ups were not set and he was taking away the biggest threat). Coach says: This is pretty simple. After Luke throws the dump, his defender watches the disc instead of finding Luke and establishing position. Luke can go wherever he wants and the defender has no idea where he is. Easy score. Coach says: This is almost the exact same situation as Play 1. PGL's man is in the open side lane, PGL has his body on his man, he sees the cut coming, and this time he's early enough to get the D.